A reader of this blog named James, sent a short history of April 1 and he requested it to be published. When I went through the story it was awesome, so I immediately published it. Read the history story below. 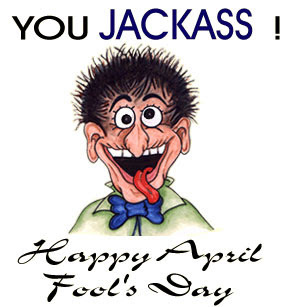 April 1 is called FOOL day after Steven April. He was born on 1st April 1300; he did 1005 businesses during his lifetime. Steven lost his father’s assets, so everybody around him started calling him father of fool. At the early age of 17, he married a 61 year old woman. After a year of their marriage the woman divorces him because of his foolishness. He used to read all kinds of fake stories like you are doing right now. It’s a great idea to fool you in April. I thought you were being serious…mtshwwww! A person who pranks in foolishness is the sovereign of fools!